Planting and maintaining a healthy vegetable garden is a cornerstone of food independence. Like people, plants have relationships. By respecting these plant relationships, you can increase your yields. You’ll also decrease pest problems, and reduce the amount of effort it will take to make your garden needs to thrive. The following guide will help get you started on a successful journey to food independence. Every great project begins with a great plan, and your garden is no exception. 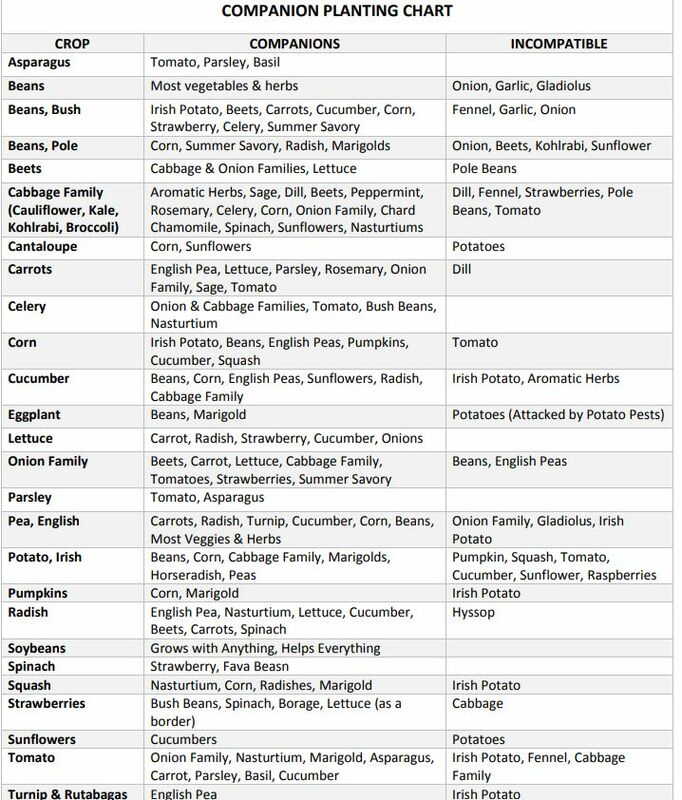 Make a list of all the seed varieties you will plant and decide how many plants you want. One critical factor in growing a healthy garden is space. Make sure you have enough room for the number of plants you desire. You don’t have to be a great drafts-person, but a couple of basic tools will help. Using graph paper and a ruler, draw your garden to scale. Determine the dimensions of your mature garden plants and design with them in mind. This will help you figure out how many plants you realistically have space for. Avoid planting long rows of only one variety of plant. This way insects or disease won’t be able to wipe out an entire type of vegetable in one fell swoop. Instead, inter-plant with friendly flowers and herbs to deter pests and support your vegetables. Then, map out where you will place your plants or seeds to optimize their benefits to one another. The most popular companion planting is the Three Sisters. Europeans noticed Native Americans using this practice back in the 1600s. In this cozy relationship, corn, beans, and squash grow together in a symbiotic system. The corn provides support for the beans, which in turn add nitrogen to the soil. The squash shades the soil and prevents weeds from growing. To plant the Three Sisters, begin by preparing a mound around four feet wide and one foot tall. You may want to fertilize with a bit of fish emulsion or meal to prepare your mound. In an area with a diameter of two feet, plant six kernels of corn ten inches apart and one inch deep. Once the corn stalks are about half a foot high, plant four beans around each stalk. (Make sure you plant pole varieties rather than bush beans.) After another week, plant six squash seeds, evenly spaced, around the perimeter of the mound. A word of warning: This type of companion planting is space-intensive. So you may want to experiment with Three Sisters outside of your garden area. (The squash will cover a lot of ground). Some plant companions also go great together on the dinner table. Some good examples are peppers, tomatoes, basil, onions, and garlic. Tomatoes thrive when alternated with pepper plants. Basil grown close to tomatoes improves the tomatoes’ flavor. Onions and garlic can be grown close by these companions, but they’re usually planted in fall and harvested the following spring. They may be ready to harvest right around when tomatoes and peppers are ready to go in the ground. Asparagus and parsley are good buddies for tomatoes, but there are a few plants to watch out for. Corn and tomatoes can come under attack by the same pests, and shouldn’t be planted too close to one another. Potatoes and tomatoes suffer from the same blight, and should also grow far apart. Kohlrabi and mature dill will stunt tomatoes’ growth. It’s best to keep them in another part of the garden altogether. Some companions grow to similar heights. That’s especially convenient when it comes time to harvest. Lettuce likes to grow near beets, cabbage, carrots, chard, onions, radishes, and strawberries. Spinach and cauliflower enjoy each other’s company. Careful with those strawberries, though. They don’t grow well near cabbage or kale (the brassica family in general) but flourish grown with thyme. When planting groups of companions like these, it’s best to know their harvest cycles. For instance, you harvest cabbages, carrots, and beets one time, but strawberries and chard can be harvested again and again. It helps if there is something near the single harvest plants to deter weeds and shade the soil. You can also plant root vegetables in cycles so that all your beets or carrots are not mature at the same time. One way to make efficient use of your garden is to plant the under-story of tall plants with root vegetables. The wisdom of nature makes this possible with some of the well-recognized combinations. Take peas, for example, which will thrive side-by-side with beans and cucumbers. These three will take the high road, climbing up whatever supports you’ve provided them. Down below there is also potential for a lot of action. Carrots, radishes, and turnips will grow well in the shadow of the climbers above, and the radishes will deter cucumber beetles. Planting chives can help keep aphids at bay and mint will improve the flavor and health of your climbing crops. One thing to watch out for when growing cucumbers is melons. The species are so genetically close that if they cross-pollinate, you may end up with fruits that are neither cucumbers nor melons, but rather something in-between. As remarkable a phenomenon as it may be, the products of this marriage are not what you want. While many of these vegetables and herbs grow together in harmony, some plants simply cannot tolerate being together. Peas and pole beans should never be grown near onions, garlic, or shallots. The bottom-dwellers won’t affect the peas. But, they will prevent the climbers from achieving their growth potential. Meanwhile, bush beans and beets stunt each other. Fennel will attract beneficial insects. It will however inhibit the growth of most plants except eggplant and dill. Dill stunts the growth of tomatoes and carrots grown nearby. It also tends to cross-pollinates with cilantro, ruining both plants. Despite their seeming similarities, carrots and parsnips will fail grown side-by-side. Turnips are incredibly competitive with other root vegetables. Plant these on their own so they don’t hog all the resources. If this is starting to sound as complicated as a seating arrangement at a family reunion where half the people hate each other, don’t worry! Take a deep breath and realize that only a handful of plants are actually harmful to one another. The easiest way to keep it all in order is to refer to a chart or make one yourself as a planting guide. Now that your head is spinning from all the complicated relationships you’ve learned, it’s time to meet some generous plant heroes. These are the one that benefit most of the plants in the garden. These herb and flower allies are completely beneficial and will grow anywhere in your garden. It’s recommended that you interplant them throughout the garden to improve growth and yield. They’ll also repel pests and attract beneficial insects. Basil is an all-time winner for repelling mosquitoes, flies, and other garden pests. Plus, it can be frozen or preserved as pesto or dried for wintertime use. Chamomile increases the nutrient content and improves the flavor of vegetables. It can also be harvested and dried for tea. Both chervil and chives repel aphids and other pests, and make a great garnish or seasoning. Marjoram is a delicious herb that improves crop yields and tastes a little like oregano. Tarragon repels pests and improves the growth and flavor of crops, while thyme attracts beneficial insects that feed on aphids. Borage is an attractive flowering plant that attracts pollinators and increases neighboring plants’ disease resistance. The leaves and flowers are also edible and taste a little like cucumber. Marigolds offer cheerful flowers and are useful for repelling pests. They can be used everywhere in your garden and will reseed every year. Sunflowers are a gorgeous addition that repels aphids and lures pests away from vegetables. Harvest them at the end of the season for their delicious seeds and have many other uses. Companion planting works because it mimics the growing systems found in nature. Monocultures, used by industrial-scale farming, are inherently weak and rely on chemical pesticides and fertilizers to control insects and keep production levels high. The benefits of having a garden that provides for you and your family and has its own built-in pest control cannot be overstated. If you rely on your garden for food, the less inputs required from outside source the more secure you will be. Aside from the strategic benefits of companion planting, your garden and pantry will be richer for it. The many spices, teas, and tinctures you can make from your herbs will serve you even when your garden is under a foot of snow. And the abundance of vegetables can last you for years when you preserve it properly.